Representing the first U.S.-based project for Spanish studio Aranguren + Gallegos Arquitectos, the new home of the Institute of Contemporary Art, Miami (ICA Miami) will be opening its doors to the public on Friday, December 1st. The ribbon cutting marks the start of Art Basel Miami Beach 2017, and the 37,000-square foot ICA Miami will be hosting a special exhibition of rising and well-established contemporary artists across all three stories of gallery space and outdoor sculpture garden. Representing a threefold increase in size over the old ICA Miami, the new museum is located in Miami’s Design District and includes new spaces for educational and community programming. Each of the building’s three floors are double-height, with the six ground-floor galleries holding long-term and permanent collections, while the second and third stories will host rotating special exhibitions for a total of 20,000-square feet of indoor presentation space. 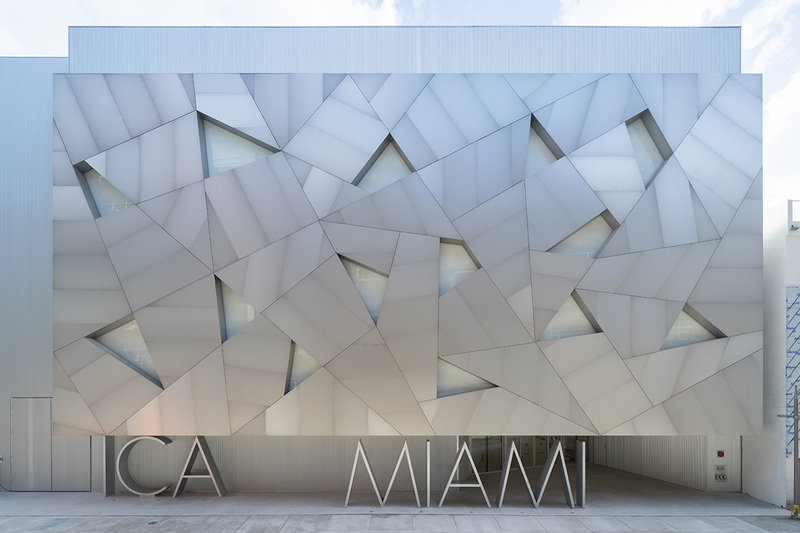 Visitors to the ICA Miami are greeted by a three-story metal façade made up of interlocking, patterned metal triangles and lighted panels, with cut-outs that specifically frame views from the museum’s interior. The back of the building features an all-glass curtain wall that allows guests on every floor to peer out over the 15,000-square foot, landscaped sculpture garden, and brings natural light into the gallery spaces. Besides hosting site-specific commissions and work by both post-war and contemporary sculptors, the garden also features educational space for public programming. A breezeway by the museum’s entrance gives visitors the option of walking directly from the street entrance to the back garden. The museum’s inaugural exhibition, The Everywhere Studio, seeks to examine the role of the artist’s studio and is a veritable who’s-who of post-war and contemporary artists, featuring works by Anna Oppermann, Carolee Schneemann, Roy Lichtenstein, Picasso, and more. Admission is free for the public. Oyler Wu Collaborative partner delves into jewelry design. Oyler Wu Collaborative partner Jenny Wu had long dreamed of designing jewelry—just as soon as she found some spare time. Last fall, she realized that she might wait forever for a break from her busy architecture practice. "At some point I decided, 'I'll design some pieces, and the easiest way to make it happen is just to 3D print them,'" said Wu. She fabricated a couple of necklaces, and brought them on her just-for-fun trip to Art Basel Miami Beach 2013. "I wore my pieces around, and I was stunned by the response I was getting," she recalled. "People kept coming up to me, literally every five seconds. After a while, I thought, 'Maybe I do have something that's unique, especially for a design crowd.'" Back home in Los Angeles, Wu began prototyping necklaces and earrings for retail sale under the name LACE. Though she originally planned to use 3D printing only to mock up her designs, she decided carry the technology through to her finished pieces. "I'd like to do more high-end, low-run pieces," said Wu. "Especially for jewelry, when you're making custom pieces, people are willing to wait for them. It just made sense from the production point of view for me to use 3D printing." Wu's next step was to design additional pieces and test materials. Typical 3D printing materials like nylon "might look great, but they're extremely fragile and brittle," explained Wu. "Especially resins—they don't have the right tensile quality. Like if you're wearing a necklace and someone hugs you too hard [it can break]." Wu's current line includes necklaces in an elastic nylon material. 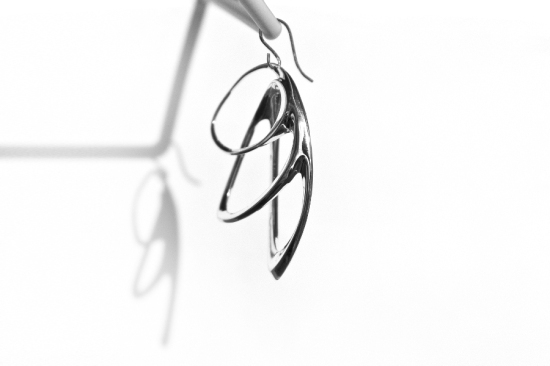 She also offers earrings and rings in polished nylon that takes advantage of selective laser sintering (SLS) technology, plus a premium cast-metal series that utilizes 3D-printed wax molds. Wu, who is collaborating with Stratasys on certain designs in addition to partnering with other professional 3D printing firms, aspires to use the technology as more than just a production expedient. "Pieces that push the technology are important," she said. "There's so much detail you can introduce in 3D printing, even in metals. You can create this nice edge detail—it's something I notice, but it isn't necessarily something you'd see in jewelry." Nor is the speed with which she can materialize a concept typical by jewelry-world standards. "I can make these chain-link pieces as part of one print, because the support material is something like powder that you can basically wash off," explained Wu. "That's what's amazing, where in the traditional jewelry-making process you'd have to make individual links that you'd eventually assemble." In a neat closing of the circle, LACE returned to Art Basel Miami Beach last week, this time in a pop-up shop at Aqua Art Miami. One year into her experiment, Wu is comfortable having one foot each in the worlds of jewelry and architecture. "If you look at the jewelry pieces, you see how they could relate to our architecture: our emphasis on line-based geometries, the interesting bundling and layering of material, and creating something very spatial, not graphic and flat," she said. "I don't see a separation between my architecture and my jewelry." As for the day-to-day reality of spearheading two creative businesses at once, that seems to be working, too. LACE is in Wu's name, but "the work's happening simultaneously with all the same people," she said. "While it may have its own identity, it's very much part of our office in terms of production. We like how it keeps things fun." For Miami Art Basel this year, food artist Caitlin Levin and photographer Henry Hargreaves teamed up to recreate some of the most architecturally masterful art museums of the world using a very sugary medium. In candy, chocolate, gingerbread, and icing, the New York City–based collaborative pair have molded and modeled highly detailed scale versions of six iconic art spaces. 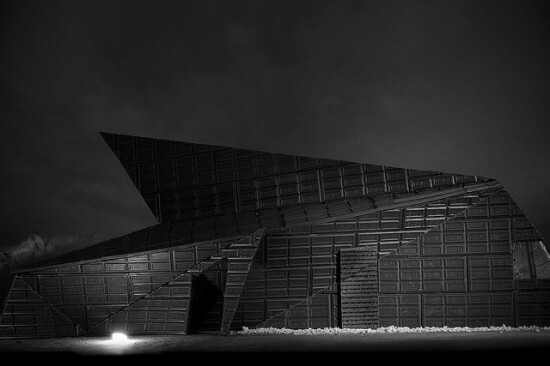 Photographed by Hargreaves in black and white, the dynamic chocolate angles of Yasui Hideo’s Karuizawa Museum and the sweeping icing curves of Frank Lloyd Wright’s Guggenheim almost seem real. From December 5 to 8—the duration of the annual international art show—the pictures will be exhibited at Dylan's Candy Bar in Miami. 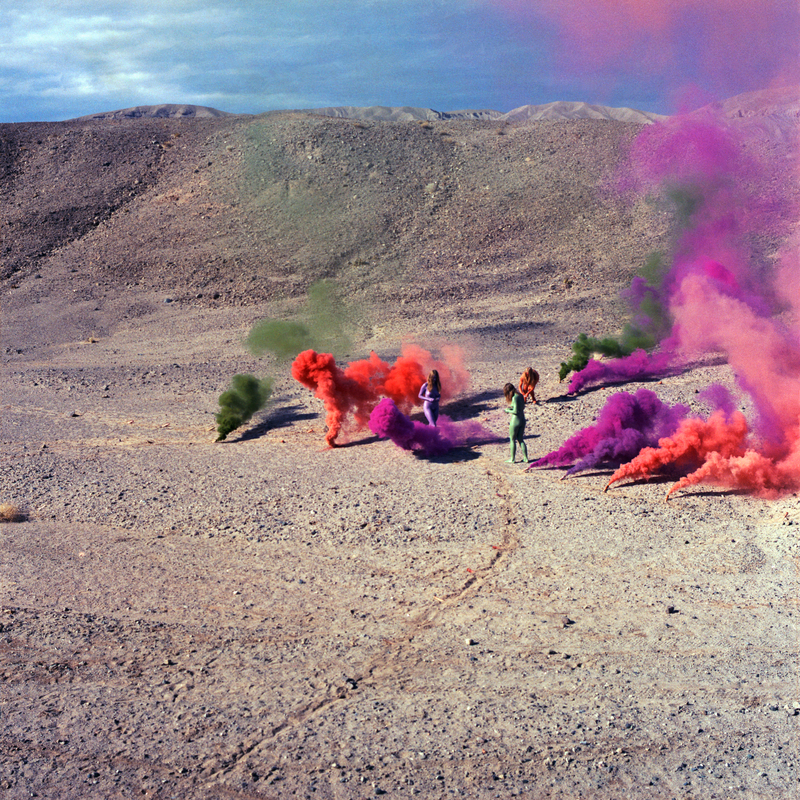 In a series of articles over the past week, The Art Newspaper takes an extensive look at the recently concluded art extravaganza in Miami. 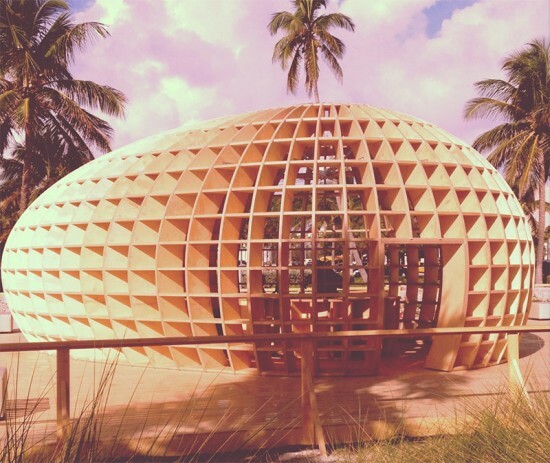 It reports that the scene was not as grim as last year, offering this roundup of celebrity-studded Art Basel Miami Beach: “The fair attracted its usual tribes of pop stars, fashionistas, museum directors, actresses in sky-high stilettos and dressed-down buyers, including a denim-clad Roman Abramovich, the Russian billionaire. Lily Allen was sashaying around White Cube, while John Taylor of Duran Duran showed interest in a Richard Prince collage at Gagosian.” But while on the subject of Miami and its art world, the paper reported on Terry Riley’s exit from the Miami Art Museum (MAM), and added a few interesting tidbits to the story. 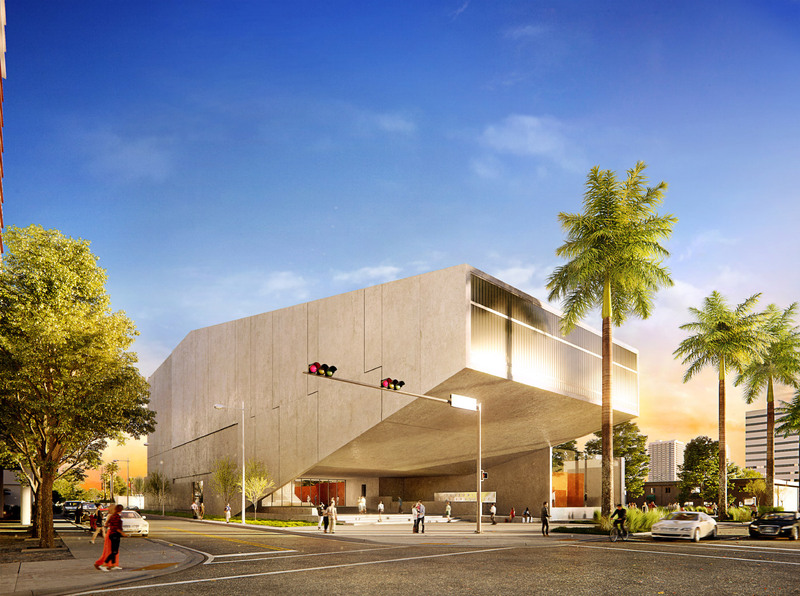 The paper claims that Craig Robins—a MAM trustee and the person behind developer Dacra and the Miami Design District—was surprised by Riley’s departure, given that he had just unveiled plans for the museum’s new $220 million Herzog & de Meuron–designed home. “He saw the writing on the wall. It was either get out now or commit for another five years,” said Robins. Yet Robins also suggested that Riley might not have been the right fit for a protracted building project. 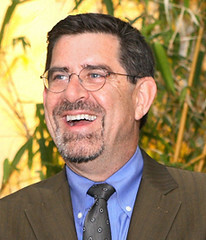 “Terry was brilliant,” Robins said, “but his strength does not lie in construction management.” The paper also claims that Riley was frustrated by a spending squeeze imposed by Miami-Dade County earlier this year, which resulted in a $350,000 funding cut. The museum laid off eight members of staff, and senior management saw their salaries cut by 5 percent, all of which, according to the paper, contributed to Riley’s departure from the museum. Riley, as we pointed out in our story, will focus his energy on his Keenen/Riley architecture practice.